Found this via our great sponsor, Moe Sport Shops' Facebook page. Don't follow them yet? You should. Click here. People like to throw around the phrase "He just gets it." a lot. I have no idea what that means, but I think they're right. Click image to be taken to the Moe's home page. 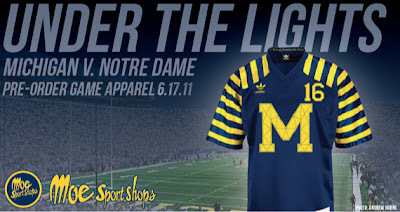 Don't forget about the throwback's for the Notre Dame night game on September 10th. Pre-order all of your "Under the Lights" apparel from Moe Sport Shop starting this Friday, June 17th.